Getting Real details the business, design, programming, and marketing principles of 37signals. The book is packed with keep-it-simple insights, contrarian points of view, and unconventional approaches to software design. This is not a technical book or a design tutorial, it's a book of ideas. Anyone working on a web app — including entrepreneurs, designers, programmers, executives, or marketers — will find value and inspiration in this book. 37signals used the Getting Real process to launch five successful web-based applications (Basecamp, Campfire, Backpack, Writeboard, Ta-da List), and Ruby on Rails, an open-source web application framework, in just two years with no outside funding, no debt, and only 7 people (distributed across 7 time zones). Over 500,000 people around the world use these applications to get things done. Now you can find out how they did it and how you can do it too. It's not as hard as you think if you Get Real. 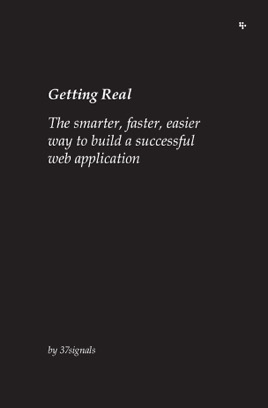 This book on Web application design is a classic, but its presentation in the iBookstore is pretty terrible. Fly-outs inline with the text, blank pages for no reason—even LINE BREAKS MID-WORD. The presentation is so jarring that it's difficult to follow and shows none of the attention to detail that is usually attributed to the authors. You'd think a book available for free online would be able to get it right for $12, but no. Broken lines, broken formatting. Even language set incorrect, so iBooks dictionary does not work with this file. Very bad quality for $12 dollars. This book will teach you how to make your own luck. If you’re running a startup, finishing this book is urgent for you.